With SEOmonitor you can explore your competitors' top keywords, that is, all the keywords for which your competitors rank in Google searches. Next to each keyword, the competitor's ranking is displayed, alongside the monthly search volume, the cost-per-click (CPC) in Adwords, and the percentage of the estimated competitor's traffic that is generated by the keyword. For the common keywords, the rightmost column shows the keyword groups where they are tracked in your campaign. If any of their keywords are also relevant for your campaign, they can easily be added by using the +Start Tracking option, in the same column. 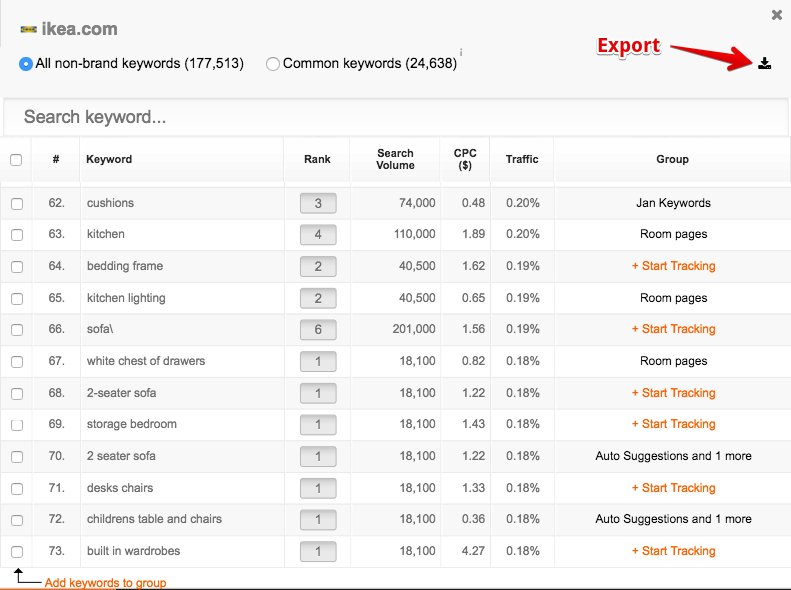 Finally, up to 50.000 of your competitor's keywords can be exported from the button in the upper-left corner. Which keywords should be tracked?